NEW YORK - An extract of green tea wards off colorectal cancer, animal experiments show. According to research reported at the Sixth International Conference on Frontiers in Cancer Prevention, sponsored by the American Association for Cancer Research, a standardized green tea polyphenol preparation (Polyphenon E) limits the growth of colorectal tumors in rats treated with a substance that causes the cancer. “Our findings show that rats fed a diet containing Polyphenon E are less than half as likely to develop colon cancer,” Dr. Hang Xiao, from the Ernest Mario School of Pharmacy at Rutgers University, Piscataway, New Jersey, noted in a statement. I have been paying a lot of attention to the benefits of herbal tea recently. I have started drinking bitter melon tea which is supposed to help in bringing down your blood cholesterol level. I've also started drinking cassia alata tea which is a natural diuretic, laxative and is also helpful in bringing down blood sugar. This news about green tea and how effective it is about warding off colorectal cancer is simply great news. 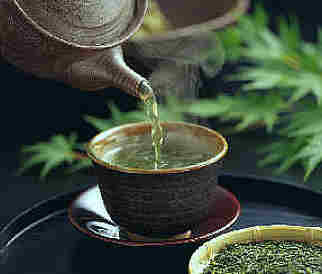 I know people who drink a few cups of green tea daily because they believe in the benefits of the tea. With this great news, I think I should start drinking green tea too! I am quite the hypochondriac and last year when I started noticing how narrow the size of my stools was, I quickly made an appointment for colon screening. Boy, what an experience that was! Fortunately the results of the screening was all positive. The only problem I have with tea is that I cannot drink it on an empty stomach. I have to drink tea or coffee for that matter, after a meal. That is not difficult to do. Tea, fortunately, is one of the free foods for those of us who are monitoring our blood sugar. That means I can drink as much tea as I want in a day and it is not going to affect my blood sugar much. How about green tea dalam tin ulih kah? Au, dalam tin meh nya .. as long as it is gree tea. Perut aku pedih enti ngirup too much tea.